If you love wildlife and enjoy country walks, you’ve got the makings of a badger patroller, writes Lesley Docksey. 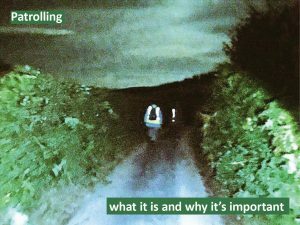 You can walk at night if you want to, but daytime observation on country lanes and footpaths is no less important, watching out for the signs of cullers at work. And with the trust and warm friendship that builds among badger patrollers, you’ll never be without congenial company. The many thousands of people who support badgers, do the marches and sign petitions, does not translate into thousands of ‘boots on the ground’. Why?